This website, dedicated to the writings of Jane Johnston Schoolcraft and the world she lived in, is designed to accompany The Sound the Stars Make Rushing Through the Sky: The Writings of Jane Johnston Schoolcraft, edited by Robert Dale Parker. 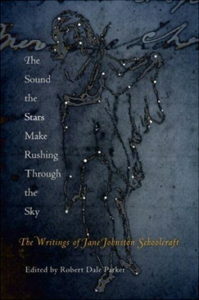 Published by the University of Pennsylvania Press, The Sound the Stars Make Rushing Through the Sky offers an edited and annotated collection of Schoolcraft’s writings, together with a cultural history, biography, and literary critical introduction. Jane Johnston Schoolcraft (her English name) or Bamewawagezhikaquay (her Ojibwe name), Woman of the Sound the Stars Make Rushing Through the Sky, was born in 1800 in Sault Ste. Mar ie in what is now the state of Michigan. By the time she died in 1842, she had produced a large body of literary and other writings. 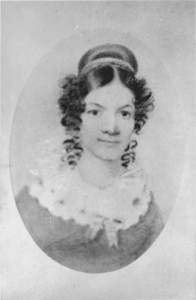 Eclipsed from the historical record by her famous husband, Henry Rowe Schoolcraft (1793-1864), Jane Johnston Schoolcraft was nevertheless among the first American Indian writers. She was also the first known American Indian literary writer, the first known Indian woman writer, the first known Indian poet, the first known poet to write poems in a Native American language, and the first known American Indian to write out traditional Indian stories (as opposed to transcribing and translating from someone else’s oral delivery, which she did also). Her stories became a key source for Henry Wadsworth Longfellow’s sensational bestseller The Song of Hiawatha. The Sound the St ars Make Rushing Through the Sky finally makes her writing available, most of it from manuscripts and appearing in print for the first time. Schoolcraft’s mother, Ozhaguscodaywayquay, was born in Chequamegon in the mid 1770s, near the present Chequamegon Bay and La Pointe in the northernmost part of what is now Wisconsin. Ozhaguscodaywayquay’s father was Waubojeeg, a war chief famed for leadership in war and civil life as well as for eloquence in story and song. Schoolcraft’s father, John Johnston, was born into a Scotch-Irish family in the north of Ireland in 1762. He left for the United States and Canada in 1790 and eventually set out as a fur trader, traveling by canoe to Mackinac Island and the Chequamegon area. After their marriage, Ozhaguscodaywayquay and John Johnston settled in Sault Ste. Marie, where together they built a prosperous fur trade business and raised eight children, while also playing leading roles in the surrounding Ojibwe and Euro-American communities. The photo at the top of the website shows the Mackinac Bridge. 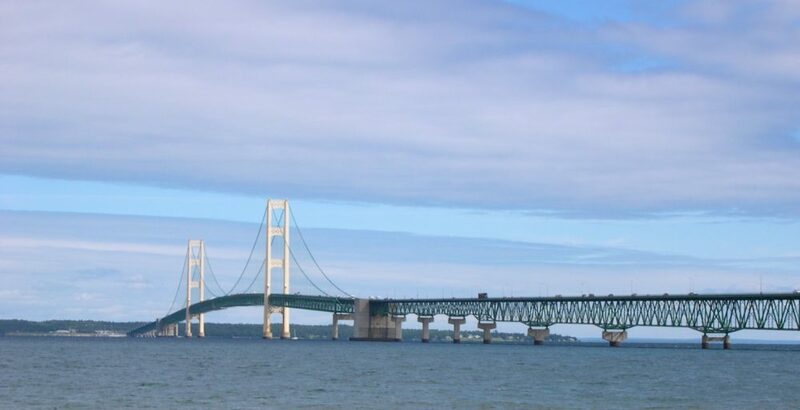 Completed in 1957, it crosses the Straits of Mackinac to connect the Lower and Upper Peninsulas of the state of Michigan. Schoolcraft crossed the same waters many times by canoe. At 5 miles long, the Mackinac Bridge is the world’s longest total suspension bridge.